Straight Cut 1:1 ratio +A 1275 transfer or drop gears. These provide that ever so noticable whine you hear in some vehicles. 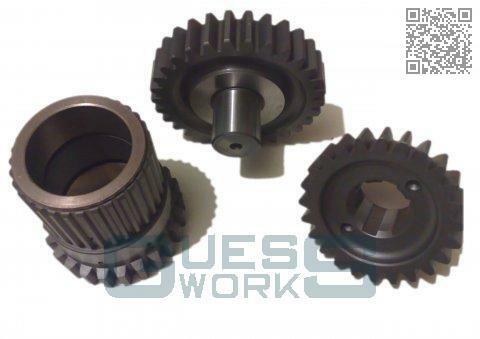 Although technically a weaker design than the std Helical gears, the materials used in manufacture make these every bit as strong, if not stronger. The reduced side load on the transfer case, and reduced transmission loss, make these the gears of choice for the performance Classic Mini engine.